Four years ago their villages had been occupied, the grown men in their community killed and older women bussed away to empty land. They were considered useless. But the girls and young women were taken as concubines; raped, enslaved and treated brutally by ISIS militants. The Yazidis are an ethnically Kurdish religious minority, the majority of whom lived in Iraq's Sinjar region. Despite the ousting of most ISIS militants from the region their ordeal is far from over. I was here with Khalsa Aid, a British Sikh charity that has been working in Iraq since 2014. Their efforts have focused on ensuring food and water provisions for Yazidi and Assyrian refugees, trauma counselling services and helping displaced Sikhs. "Some of these girls still wear the clothes they fled their captors in," says Khalsa Aid project coordinator Kanwar Singh. "They’ve lost all their possessions." So I took them shopping for clothes. They don't just get to buy more than one outfit, but also choice and autonomy after years of violent restriction. 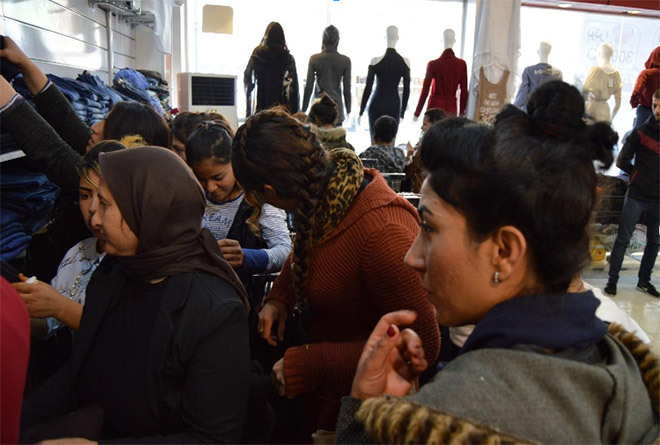 I watched as dozens of Yazidi girls and young women shuffled into a family-owned clothes market. Their fingers tentatively felt through the rails and stacks of everything, from jeans to traditional dresses. I was struck by their initial reluctance – are they really being taken shopping? Layla, 32, lived 20 km from Mosul with her husband, three sons and daughter, when ISIS attacked in 2014. She and her daughter were separated eight months later and sold to another man. "He bought two of us and I was forced to marry him too," she told me. Even after she was freed, Layla attempted suicide with her daughter. Values of 'honour' and 'shame' still rule the lives of women here. But when she heard news that Baba Sheikh, the Yazidi supreme spiritual leader, declared the acceptance of those returning with open arms, she changed her mind. I also met the ever-smiling Hannah, now 14, who was kidnapped by ISIS militants when she was just 11. She had been beaten, she had been raped, she had seen people get killed, she told me. And I met Hadia, 18 years-old, who fondly remembers a childhood replicating outfits for her dolls. Khalsa Aid recognised her gift as a seamstress and supported her with a sewing machine. She has set up a shop in the front room of her tented home. When we went shopping together, Hadia shopped for new material and machine repair. She confidently walked the bazaar scrutinising for the best deals. "My health improved after sewing," she told me. "I was not OK mentally but the sewing machine made my thoughts better. I could focus on sewing." She wanted use shopping material for her shop and grow her business. When we finished, I went back to ask Hannah if she had a good day. "When I was in ISIS’s hands, all I had to wear was black from my shoes to my head. And they would bring it to me. But today I had the opportunity to go shopping again. And buy as many colours as I wanted!" Khalsa Aid are doing vital work in Iraq, helping locals. Please support their work by donating as much as you can.